Took me a while but I decided that the snake is not scared. He is worried. The girl, I’m gonna call her Lucy, or Luce for short, is a believer. The snake, who shall remain nameless, does not understand this. Not for he the finer aspects of faith or philosophy. The snake sees things in black and white, or in this case red and yellow. Luce however is on a journey. It matters not whether she is butterfly hunting, snake hunting or even out collecting dragons eggs. It’s a journey. Where this journey is taking her is another issue. 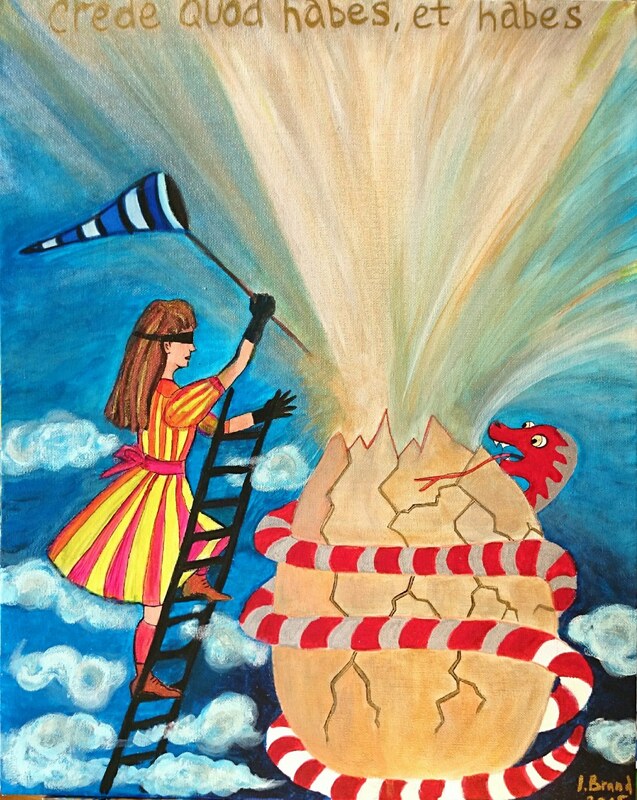 She may be about to enter oblivion, the fire emanating from the recently cracked open egg horribly consuming. There could be a dragon flying overhead about to swoop down and sink its claws into her. I suspect the artist may have wanted us to think the snake came out of the egg but the egg is far too big for the snake. Old snakey boy may have been circling the egg and wondering whether it was too large to swallow whole when it was taken by surprise and saw the dragon hatch. 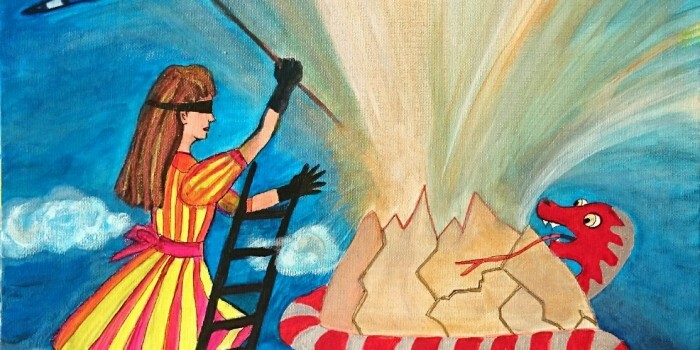 On the other hand our heroine may reach the top of the ladder, step trustingly into the lava filled ovoid cauldron and sink with deep satisfaction into its warm and comforting embrace. Our duty here at first glance is to admire Luce. We should not be concerned with the tribulations present in the mind of the snake. Luce is where it is at. Or is it? Luce is unquestioning. Trusting. Perhaps devoid of anything really interesting to talk about beyond her faith. Does the snake represent the thinking person? What are you up to Lucy? For goodness sake girl. The snake is not worried that Luce is trying to catch him. Her net is implausibly small although try telling her that. He is thinking her trust in any outcome does not make sense. He may also be wondering where he could get hold of one of those ladders. Looks very handy, being able to be climbed up without having to prop it up against anything solid. The disappointing thing about all this is that we will almost certainly never find out what happens to Luce or to the snake. It is something beyond our capability. Unless of course the artist has a sequel in mind but I suspect that is not the point. Where does the snake go from here? I think he certainly wants to talk to someone about what he has seen. If you are worried about something then talking about it is a good thing to do. I don’t even think worry is the right word here. It’s an enquiring concern. Whatever happens we are where we are. The backdrop has been painted and we click frame by frame through the scene emerging before us. We can change the colours and even alter the brightness but can we change the outcome? Posted on February 7th, by Iwyna Brand in fusion. For a generous response. It always amazes me how different our interpretations are. That’s why I admire symbolism, for such a great opportunity to unwind imagination. “Psychotherapy and mind” was painted for my friend, hypnotherapist in Germany. The girl in my opinion represents a Therapist, ie person who’s eyes can’t see what is hidden inside the mind but nevertheless she is trying to get some explanation or at least, a sample. The hatching egg could be a patient himself and emerging concept (or idea) in patient’s mind, while the coiling snake is the force of the Unconscious, ready to consume whatever the mind brings.